Mercury, the speedy little planet closest to the sun, is making a special twilight appearance this month as a bright pink dot low in the sky. The show started on Feb. 8 and will continue until Feb. 21. If the sky is clear, Mercury should emerge about a half hour after sunset. NASA scientists recommend looking for the pink planet near the horizon where the sun's lingering glow is the strongest. Mercury is not actually pink, but it will appear so, colored by the sunset's rosy light. Starting tonight (Feb. 11), the apparition will linger for as much as an hour after sunset. And tonight, Mercury will pop out straight below the crescent moon, which should help novice skywatchers spot the planet. Mars will also be visible just below Mercury, completing a celestial trifecta. 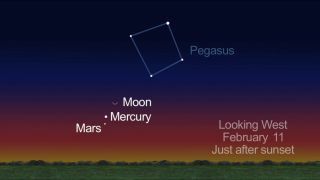 In fact, Mars and Mercury should hang relatively close together for the next few days, making an inviting target for stargazers with binoculars or small telescopes. Mercury is only slightly larger than Earth's moon, and it races around the sun every 88 Earth days. It's about three times closer to the sun than our planet and it spins on its axis slowly, completing a rotation just three times every two Mercury years. NASA's Messenger spacecraft recently found pockets of ice at Mercury's north pole. Scientists had long suspected that they would find frozen water on the planet in areas permanently shielded from the sun's heat. Because it's so close to our fiercely hot star, the surface of Mercury can reach a scorching 840 degrees Fahrenheit (450 degrees Celsius). But without a substantial atmosphere to trap heat, nighttime temperatures on the planet can plummet to minus 275 degrees Fahrenheit (minus 170 degrees Celsius). Editor's note: If you snap a photo of Mercury or any other night sky object and you'd like to share it for a possible story or image gallery, send photos, comments and your name and location to managing editor Tariq Malik at spacephotos@space.com.